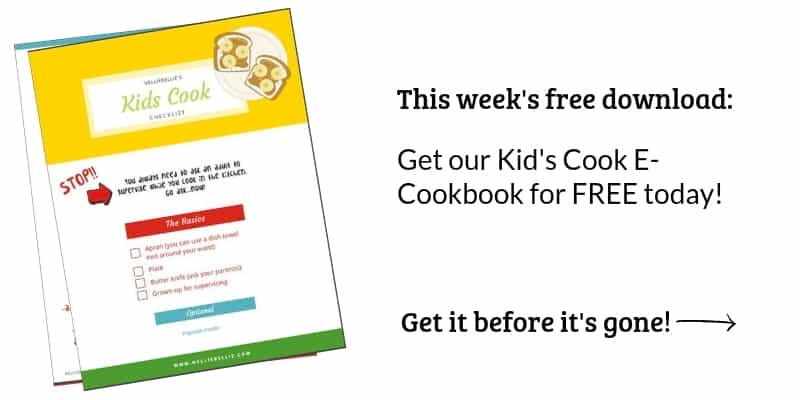 You are here: Home / Recipes / Breakfast / Eggs / Easy Breakfast Tacos and tips to make them quickly! 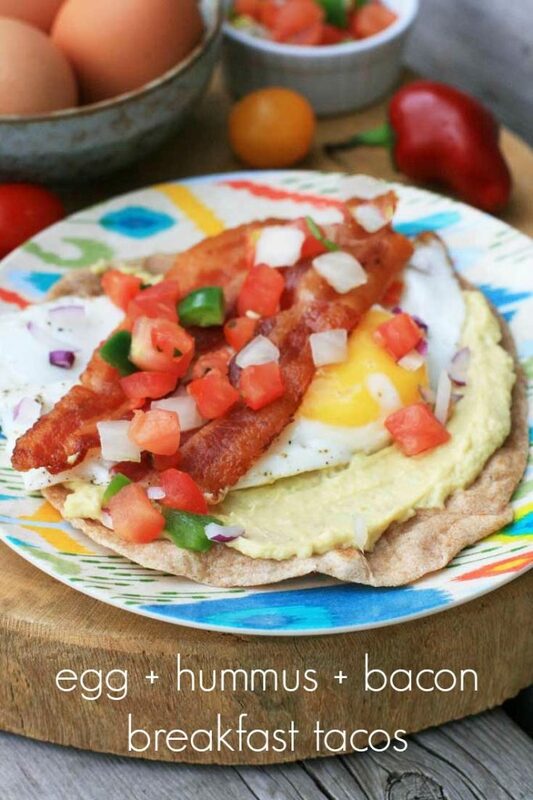 Easy Breakfast Tacos and tips to make them quickly! 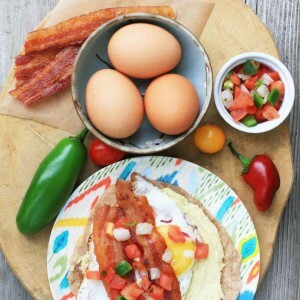 A fast, flavorful, and cheap breakfast that can be customized with different toppings. It seems like a lot of breakfast recipes out there are high-maintenance and take a lot of time to make. I don’t know about you, but I rarely have time to make a fancy breakfast. Most mornings I’m running 10 minutes late and only have time to grab a granola bar and apple. Deep down, I still want that fancy breakfast. But I’m not willing to get up earlier to get it. That’s why these easy breakfast tacos are the bomb. 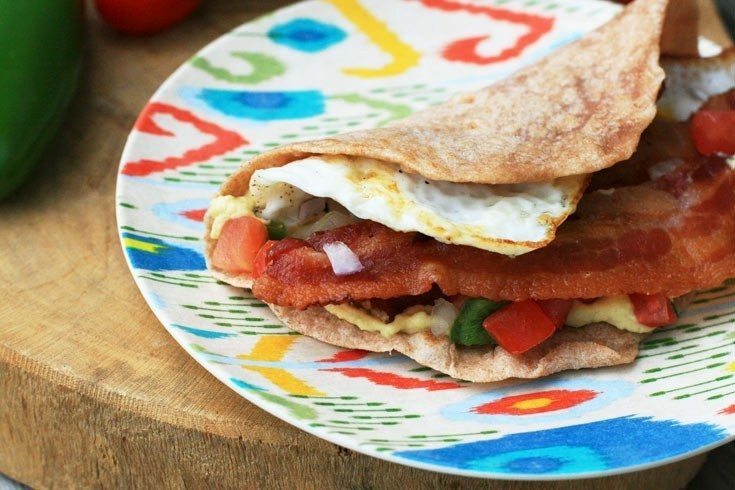 If you have time to fry an egg in the morning, you have time to make these breakfast tacos. Tortilla shells – If you have extra time, you can make your own for 5 cents each! For this batch, I used whole wheat flour instead of white flour. They are yummy! Hummus – Hummus for breakfast – who would have thought!? I used jalapeno hummus for these tacos. This added great flavor and just the right amount of spice. Pico de gallo – Although I love the freshness of the pico de gallo, you could also use salsa on top of your tacos. Bacon – To save time, I fry bacon ahead of time and freeze it. To heat up, just pop it in the microwave for a few seconds or heat it in the same pan that you are frying your eggs. When your ingredients are pre-prepped, all you have to do is fry the egg and assemble the tacos in the morning. All in all, these breakfast tacos are extremely cheap. When eggs and tortilla shells are the base of your meal, you’re not going to spend much money at all. But no one will know the difference – these things are delicious! For more cheap breakfast ideas, check out my blog. Otherwise, for money-saving tips and edible eye candy, follow me on Instagram! For each breakfast taco: Heat tortilla shell in microwave for a couple of seconds. Spread with hummus. 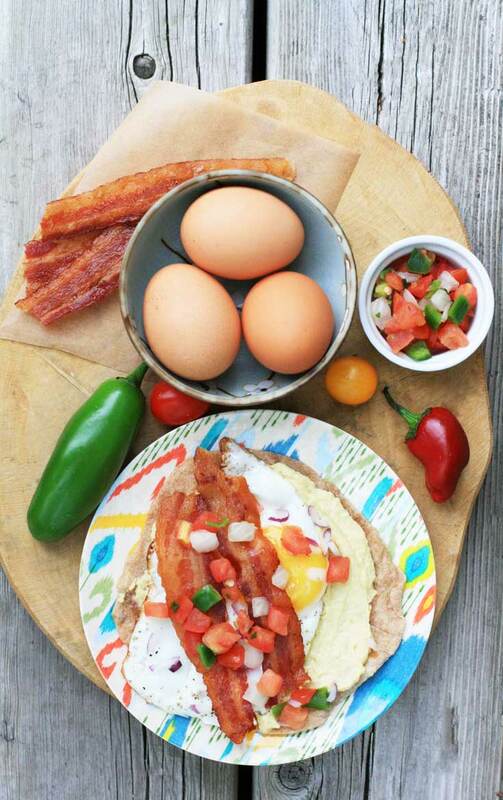 Top with fried egg, bacon slices, and pico de gallo. I really enjoy eggs — unfortunately they are our Sunday breakfast. I could have eggs every morning and this is a wonderful way to have them. I can see it wouldn’t take very long to throw it together.